SpaceX engineers ran through a customary prelaunch countdown test Saturday and fired the Falcon 9 rocket’s nine Merlin main engines at Cape Canaveral ahead of liftoff Monday with 2.2 tons of supplies and experiments for the International Space Station. The countdown rehearsal culminated in the firing of the Falcon 9 rocket’s Merlin 1D first stage engines at Cape Canaveral’s Complex 40 launch pad. Held down by mechanical restraints, the two-stage booster was programmed to ignite its engines for 3.5 seconds and build up to 1.3 million pounds of thrust before a computer-commanded cutoff. 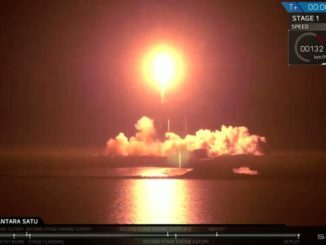 Sources said the static fire test, a fixture in SpaceX’s launch campaigns, went off without a hitch. A data review will formally clear the Falcon 9 rocket for launch after verifying the launcher’s performance during Saturday’s test. Launch is targeted for Monday at 4:33 p.m. EDT (2033 GMT), roughly the time the International Space Station’s orbit track passes over Cape Canaveral. A SpaceX-owned Dragon capsule will be released into orbit about 10 minutes later. Technicians plan to install time-critical items into the Dragon spacecraft’s pressurized cabin before the launch, including a habitat with 20 mice that will be monitored, euthanized and dissected in space to help scientists study how organisms respond to spaceflight. Two days after liftoff, after a series of course-correction burns, the automated Dragon spaceship will complete a laser-guided approach to the space station. Astronaut Samantha Cristoforetti will grapple the spacecraft with the outpost’s Canadian-built robotic arm around 7 a.m. EDT (1100 GMT) Wednesday. The Dragon will be robotically attached to the space station’s Harmony module with 16 remotely-driven bolts a few hours later, and air pressure will be equalized between the complex and the visiting cargo craft. Then the crew will open hatches leading to the cargo carrier to begin removing the freighter’s supplies. The space station’s six-person crew will unpack nearly 4,400 pounds of cargo from the Dragon’s internal module during its five-week stay at the complex. Most of the equipment is for scientific experiments for NASA, the European Space Agency, the Japan Aerospace Exploration Agency, universities and commercial customers. About 1,100 pounds of the mission’s cargo manifest is made up of crew care packages, provisions and food. Another 1,142 pounds of gear will restore the space station’s supply of spare parts, address medical needs and help repair life support systems. 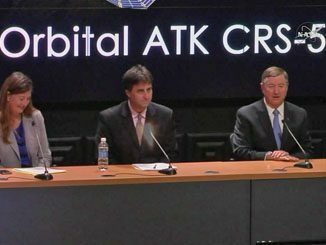 The spacecraft is scheduled to remain at the orbiting outpost until May 20, when it will detach and return to Earth with a parachute-assisted splashdown in the Pacific Ocean west of Baja California. Forecasters predict a 60 percent chance of acceptable weather for Monday’s launch. The main concerns are with anvil and thick clouds from thunderstorms on Florida’s Space Coast. 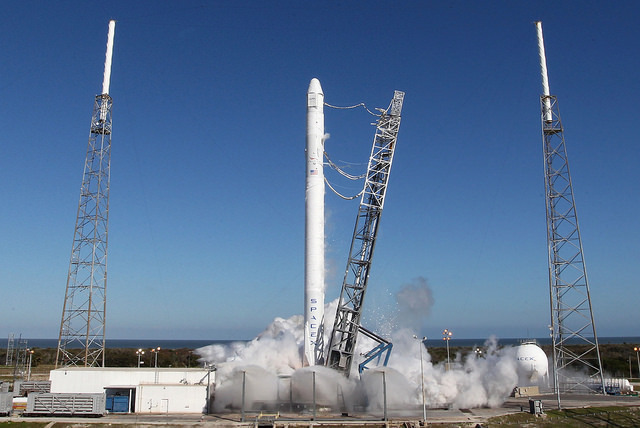 Monday’s launch will mark SpaceX’s sixth operational resupply run to the space station. 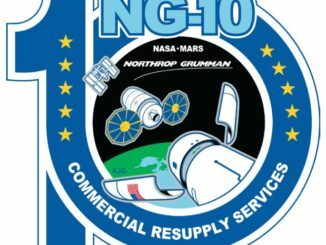 The company’s existing contract covers 15 cargo missions through the end of 2017.